Moneygram has partnered with Ripple to use its XRP cryptocurrency in money transfers. 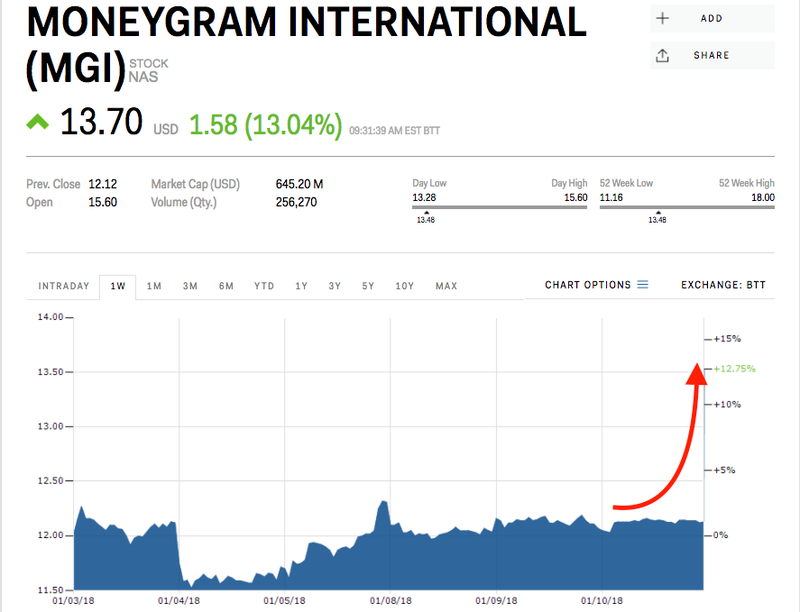 Moneygram's stock is up 13% after the news, while XRP reversed early losses to go up 1%. 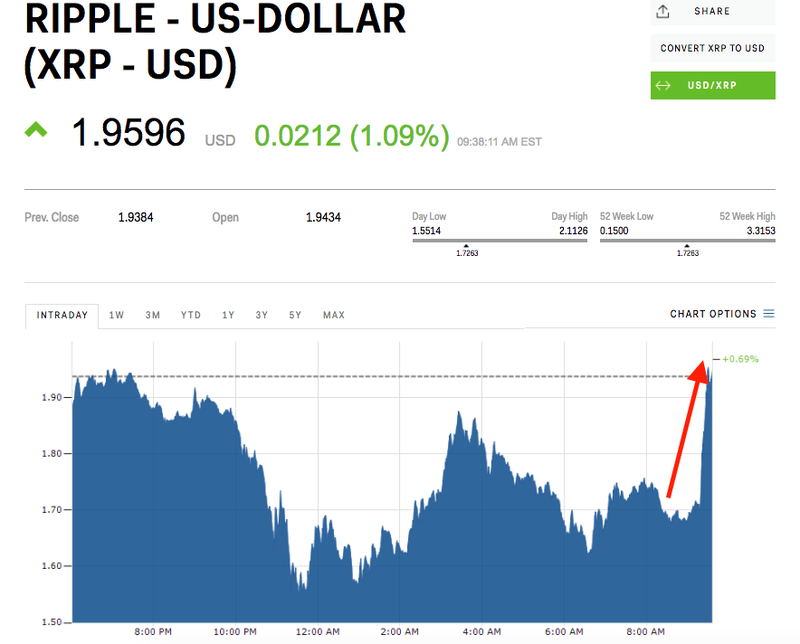 Shares of Moneygram, the second-largest money transfer company in the world, spiked 13% Thursday after the company said it had signed a partnership with Ripple to test using the company’s XRP cryptocurrency to improve transfer settlement times and costs. XRP is climbing as well, up 2.42%. Last week, Western Union spiked on an unverified rumor that it planned to also use XRP. Ripple said in a tweet that it has signed three of the world’s five largest money transfer companies, but did not elaborate on which. New York Times reporter Nathaniel Popper also said last week that he was unable to verify many of the cooperating banks the company had previously announced. CEO Brad Garlinghouse denied those claims. "The payments problem doesn’t just affect banks, it also affects companies like MoneyGram, which help people get money to the ones they care about," Ripple CEO Brad Garlinghouse said in a press release. "By using a digital asset like XRP that settles in three seconds or less, our clients can move money as quickly as information." XRP saw significant losses, down as much as 13%, Wednesday evening into Thursday morning on news South Korean regulators planned to crack down on cryptocurrency exchanges. But the token had begun to pare those losses after the Moneygram news, and was up 2.39% in the last 24 hours at the time of writing. XRP powers Ripple’s XRapid cross-border payments for emerging markets product as well as its other liquidity and transfer services. XRP is currently trading at $1.97, according to Markets Insider data, much lower than its high of $3.315 reached late last year. The cryptocurrency is still up 5517% over the past 12 months, but down 31% over the past week. Moneygram sent nearly $600 billion in cross-border payments in 2016, according to its website. "Every day blockchain technology is changing the norm and encouraging innovation," CEO Alex Holmes said in a release. "Ripple is at the forefront of blockchain technology and we look forward to piloting xRapid. We’re hopeful it will increase efficiency and improve services to MoneyGram’s customers."